Disqus is pushing very hard on REVEAL native content ads marketing now a days. They are doing lots of variations on their REVEAL product. 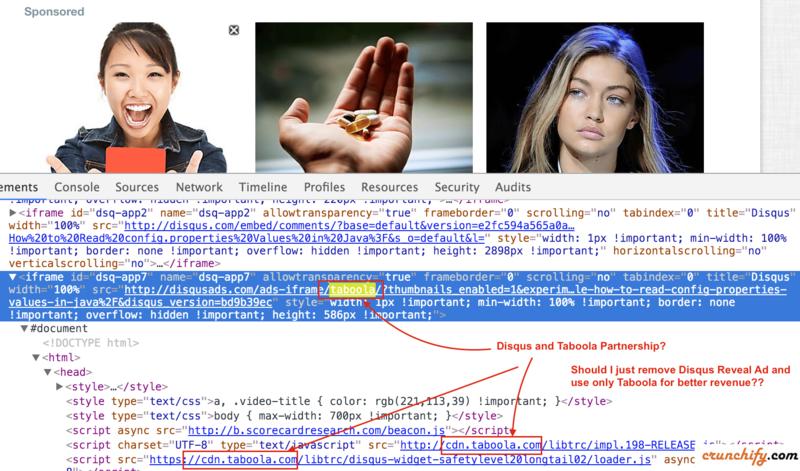 As a publisher I don’t want to load extra .js and other .css related to Taboola which may increase my page load time. I’m not against Taboola but it feels if I use directly Taboola then I’ll definitely get more money. Should I just Remove Disqus Reveal Ad and use only Taboola for better Revenue? What do you think? Let me know you thoughts. PS: As I’m moving my other few blog posts to Crunchify.com, want to mention update from Brian Falldin, a REVEAL team member who posted on the same post. Is it possible to completely opt out of having ads with Disqus?